Today, I made Eleanor's vegetables for the next week or so. She ate broccoli for lunch. It took more bites than carrots for her to get used to it, but then she gobbled it all up. We were so proud of her for eating it all. How good could room temperature broccoli puree taste, really? I made more carrots, broccoli, and some green beans, which we will try four days from now. It was still very fun, and I think it is saving some money. The vegetables I made today would be enough to last for the next two weeks (if we weren't going to try new vegetables every four days). Eleanor helped in the kitchen again, and Daddy told her that she will be expected to make her own meals pretty soon. I think he was kidding. 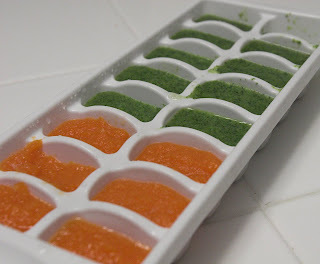 This is a picture of what homemade baby food looks like. You freeze it in ice cube trays, and then thaw out one (or more when she's bigger) cubes for a meal. I am considering pureeing all of our food and storing it this way to cut down on cooking time. I can just picture Jared's face when I set down his plate of three meatloaf cubes, one broccoli cube, and two carrot cubes for dinner (and three chocolate chip cookie cubes for dessert). You should try peas too... those are Grace's favorite. Oh and she loves Aspargus too! You should make strawberry ones, but put a stick in it before freezing. Then I'd come over and eat popsicles with you.